Massive Rise in Unemployment Benefit Numbers Comes As A Shock. In the first 5 months of 2009 rising unemployment in Australia caused 4000 New Zealanders to return home from Australia, with more than 800 coming back in May, which was the highest for that month since 1990. Perhaps somewhat prematurely John Key seized upon the opportunity to try to attract Kiwis back to New Zealand, in May The Australian newspaper carried this article “John Key implores Kiwis to come home” perhaps Key should’ve been careful with what he wished for because the number claiming unemployment benefit has jumped 300%. But he can’t say he wasn’t warned, in February David Cunliffe, opposition finance spokesman said Kwis losing jobs in Australia due to the global slump would return home to draw unemployment benefit that they are not entitled to in Australia. (Australia legislated in 2001 to allow only permanent residents and citizens to draw the dole) Looks like he was correct. ‘Jobs for Kiwis‘? Hmm go figure, but define ‘Kiwi’ first. Which group has done more for the country in recent years? Presently it’s a complete shambles, New Zealand is importing unemployment and it’s not going to be resolved through forcing employers to shed valuable, secure workers trying to renew temporary work visas – if anything it will be made worse. 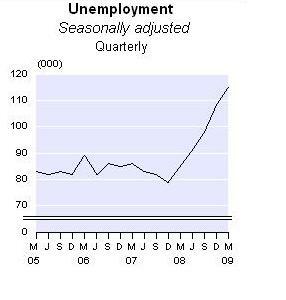 New jobs are needed as is economic stimulus. Employers are being forced to go to the time and considerable expense of trying to recruit New Zealanders to fill non existent vacancies, without any financial assisance from the government. If there were Kiwis who are both willing and able to do those jobs migrants probably wouldn’t have been employed in the first place. “Hundreds of vital migrant dairy workers will now be able to continue working in New Zealand thanks to lobbying by Federated Farmers. “Unbelievably, Immigration New Zealand was moving to remove skilled dairy workers from the Immediate Skills Shortage List (ISSL),” says Frank Brenmuhl, Federated Farmers Employment spokesperson. “It might come as a surprise, given negative press about dairy, but we still have a major skill shortage. Right now, we need more than 4000 new workers annually to cover growth, retirements and people just leaving the sector. The average age of a dairy farmer is increasing and farms have grown in size. “Despite it paying extremely well, we don’t have young New Zealanders entering the dairy sector. If the Assistant Herd Manager and Assistant Farm Manager categories were cancelled, it would have compromised exports. “The industry in New Zealand currently employs about 1,300 migrant workers from countries as diverse as the Philippines, Chile and South Africa. “Some of these workers have resided in New Zealand for a number of years and have valuable dairying experience. Sending them home would have been a complete waste of time, effort and money. “As we cannot recruit enough talent locally, we need skilled migrant workers. “When it comes to the Assistant Herd Managers category, it’s also a case of one step forward, two steps back. The fact is overseas-based Immigration New Zealand staff don’t understand dairy farming. “This has led to inconsistencies in interpreting its own criteria. We now have the farcical situation whereby Immigration New Zealand sets the ISSL but then contradicts it by failing to consistently interpret it. The farmers did it for themselves and now other employer groups are starting to do the same. The Motor Trades Association has already made its feelings known, see blog post Jobs for Kiwis: migrants not getting a fair deal on work permit extensions. Good luck to them, we hope they succeed because those high unemployment figures are a wake up call for everybody – the government needs to be creating more jobs, not hamstringing employers.